The SW11 Literary Festival continues through Sunday in Clapham Junction. Go to the website to find a specific event. 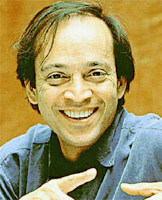 On Wednesday, Vikram Seth (pictured) reads from and discusses his latest book, Two Lives, at the Institute of Education, 20 Bedford Way. £7/£5 concessions. 7pm. On Thursday, Hanif Kureishi sits down at the London Review Bookshop to discuss his recently published memoir of his father, My Ear at His Heart. 14 Bury Place. 7pm. Contact bookstore for ticket info. On Monday, A.N. Wilson, author of The Vicorians and After the Victorians, will lecture at the Royal Society of Literature, presumably about the Victorians and what came after them. Somerset House in the Strand. 7pm. £5 suggested contribution. The website Get London Reading has compiled an exhaustive list of books set in or in some other way connected to London. We have linked above to the fiction section, but there are a number of other categories to choose from, including biography and history. If you can't find something here to pique your interest, than we dare say that you probably ought not waste your time reading this little column, either.